Why study abroad in one location when you can experience the politics and cultures of many European cities? Our European Union Program allows you to learn about European politics, economics, business, and international relations in a whole new way. Freiburg will be your home base. Nestled at the foot of the Black Forest, it’s in this beautiful, small university town that you’ll take English-taught courses in disciplines like Political Science, International Relations, Economics, and Business. As part of the program’s required Integrative Seminar, you travel for approximately 22 days to gain exposure to the European Union and beyond. Not only will these course-related trips give you better insight into the strengths and challenges of the European Union, they will also give you the experience you need to build your résumé, and to prepare you for an international career. As you visit each new country, you develop an understanding of the European Union, its history, and its institutions. Europe will be your classroom. Imagine visiting the European Parliament and discussing current social and political issues with EU officials, or meeting with leaders of multinational corporations to learn about international trade. You also engage in a Model European Union, where you assume the role of a head of state or foreign minister of an EU country to analyze and debate issues of current concern in Europe, such as migration and immigration, security and foreign affairs, U.S.-EU relations, relations with Russia, the euro currency’s troubled relationship with member countries, Brexit, and more. The Model EU concludes the Integrative Seminar, and is the capstone of the program. After the spring semester, you can also add international work experience to your résumé by participating in a for-credit internship placement in Freiburg or Brussels, with the accompanying internship seminar. Our mission is simple: to provide you with the highest quality academic and cultural experience abroad possible. We offer unparalleled courses that explore European Politics, Economics, Business, International Relations, and other topics through an in-depth and hands-on approach. Our diverse professors and course-related trips enhance your academic experience and provide you with new perspectives each day in class. You take between 16-20 credits per semester (five courses). All courses are worth 3 credits except the Integrative Seminar and the optional semester German language course. You may earn up to 20 credits if you are placed in a spring semester postprogram internship. All courses are taught in English, excluding German language courses and IR/PO355. Academic programming is scheduled five days a week. *Please note: Internships with the European Parliament in Brussels will not be available in 2019 due to Parliamentary elections. As part of your overall program participation, you will take a required two-week intensive German course during orientation. You may continue strengthening your language skills by continuing in an optional, 4-credit semester-long German language course. The Model EU, which brings together classroom-based academic knowledge and first-hand experiences gained through course-related excursions, concludes the EU Studies Integrative Seminar and the program. Please note: Due to parliamentary elections, we are unable to offer Spring 2019 European Parliament internship placements in Brussels to students on the European Union program. Students interested in an internship during the Spring 2019 term can apply for internships in Freiburg. Note that these placements typically require fluency in German and can therefore be competitive. All of our internships are supervised and earn IES Abroad credit. You participate in a 3-credit seminar to complement the practical experience you gain during the internship. Both optional post-program internships carry an extra cost. The European Union internship program is approximately eight weeks long, and occurs after the spring semester only. There are two parts to the internship: a 3-credit Internship Seminar, which is primarily conducted before and after the placement experience, and the internship itself, comprised of a four- to five-week placement in Brussels*, or a four- to six-week placement in Freiburg. During a Brussels* internship, you live in an apartment shared with other interns; during a Freiburg internship you continue to live in housing in Freiburg. You can apply for an internship before arriving on the European Union program or early in the spring term. Placements are competitive. Although your adventure begins in Freiburg, our day trips take you to other great destinations to provide contrast and context for what you are learning and experiencing in your new home. Examples of trips include excursions to the Swiss Alps and nearby castles. The cost of these trips is not included in the program cost. As a major component of the European Union Program, you participate in extensive course-related trips to prominent EU institutions and important cities across Europe. During these trips, you meet and talk with official representatives of member states, leaders of multinational corporations and NGOs, EU officials, and advisors on EU issues. You take three course-related excursions totaling approximately 22 days. These excursions are an integral part of your classes and academic program, and are included in the program fee. During the first trip, you will explore the UK leaving the EU and will visit Berlin and Warsaw. This trip will also include Paris, as of Spring 2019. Part of making you feel at home in Freiburg is doing our best to help you feel safe and cared for. Whether it’s the orientation program that prepares you for what’s ahead, your housing that is well-located and comfortable, or the day trips that take you to places off the beaten path—we’re all about our student services. The program begins with a mandatory orientation that introduces you to the IES Abroad European Union staff, your fellow students, and the city of Freiburg. Orientation also includes a trip to the idyllic Black Forest, where you can hike and enjoy a typical German Kaffee und Kuchen—an afternoon ritual of having cake and coffee with friends. Our Comprehensive Orientation & Re-Entry Experience (CORE™), begins right when you arrive and continues through the semester with activities focusing on academic and cultural adjustment. Detailed information about housing, public transportation, culture, health and safety, and other important topics are also covered. As part of your orientation, you will have 20-25 hours of intensive German language instruction, followed by a seminar that will prepare you for the first course-related trip. Shared University Apartment – You live in a single or double room in a co-ed suite with a shared kitchen and bath. Suites are shared with German and international students, and have Internet access. Meals are not included in the program cost. Students usually prepare meals in their housing or dine in Freiburg’s affordable student cafeterias. The IES Abroad European Union Center is housed in a historic 19th-century building with a fully renovated interior. Located in the heart of Freiburg, the EU Center is only a short walk from the main campus of the Albert ­Ludwigs-Universität Freiburg, the shopping district, and the Freiburg Theater. For a fun look at our EU center, check out Spring 2015 IES Abroad Blogger Kimberly Webber's video tour. Dr. Ullrich Lohrmann has been with IES Abroad since 1993. 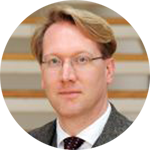 He holds a Ph.D. in History from the Albert-Ludwigs-Universität Freiburg, and has academic interests in Africa, the United Nations, and the development of the European Union. He has served in various capacities at IES Abroad and has been the Director of the EU program since 2007. He has also taught courses on the EU for IES Abroad.